The cutting-edge technology behind the HydraFacial® can rejuvenate and hydrate your skin, soothe irritated skin, and restore a healthy glow, all in as little as 30 minutes. Book your HydraFacial at the office of Kevin McMullen, MD, in Oklahoma City by clicking on the online scheduler. You can also call the clinic directly to book. 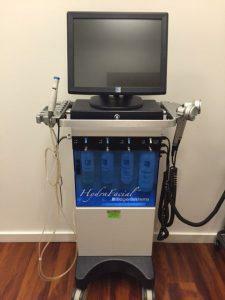 A HydraFacial is the most modern and effective way to get a facial treatment, without having to spend hours at the spa. The revolutionary HydraFacial tool delivers skin-specific serums, cleansers, boosts, and moisturizers through a series of rapid pulses. Not only does HydraFacial’s unique system draw out impurities and thoroughly clean your pores, it does so while massaging and invigorating your skin to increase blood flow. During your HydraFacial consultation, your practitioner learns about your skin needs and selects HydraFacial solutions that are ideal for your specific skin concerns. To further improve these imperfections and help you look even younger, Dr. McMullen often pairs HydraFacial treatments with Pellevé®. This state-of-the-art radiofrequency system sends waves of energy into your skin’s deepest layers. This effect stimulates collagen production, leaving firmer, tighter, younger-looking skin behind. When will I notice results after a HydraFacial? One of the reason’s the HydraFacial is a top-requested treatment at the office of Kevin McMullen, MD, is because your results are immediate. You’re going to leave the office with visibly brighter, healthier-looking skin — no downtime needed. Plus, optimal results from a personalized HydraFacial can last for up to a week. If you’re adding Pellevé treatments to your HydraFacial sessions, it’s best to schedule three to five sessions, each about four weeks apart, to achieve optimal results. With each passing day after your Pellevé treatments, your skin continues to tighten and firm up. How often do I need a HydraFacial? Because your skin continues to age naturally even after you experience optimal results following a HydraFacial and Pellevé treatment, Dr. McMullen designs customized anti-aging packages based on your needs. He often recommends coming in two to four times per month for a HydraFacial, then once or twice a year for touch-up Pellevé treatments. Get smoother, brighter, healthier-looking skin by booking your HydraFacial at the office of Kevin McMullen, MD, today. Schedule online or over the phone.